Old Dogs: Are the Best Dogs is, hands down, my favorite dog book. This is less a book review as it is an opportunity for me to encourage you to consider this one of the best gifts you can give this holiday season. A collection of short profile vignettes written by Gene Weingarten and photographs by Michael S. Williamson, this book is a tribute to senior dogs. The publishers state that anyone who has ever loved an old dog will love Old Dogs. I beg to differ. Anyone who has ever love any dog will love this book. "If you ask us which of them [the dogs] are still alive, our answer is: They all are. May old dogs live forever." Old Dogs begins with by far the longest essay. Remembering Harry is a story about Harry, a yellow Labrador Retriever, the product of a Kansas puppy mill. In telling Harry's story, the author shares observations about living with our best friends and life itself.
" Old dogs can be cloudy-eyed and grouchy, gray of muzzle, graceless of gait, odd of habit, hard of hearing, pimply, wheezy, lazy and lumpy. but to anyone who has ever known an old dog, these things are of little consequence. Old dogs are vulnerable. They show exorbitant gratitude and limitless trust. They are without artifice. They are funny in new and unexpected ways. But above all, they seem at peace. This last quality is almost indefinable. If you want to play it safe, you can call it serenity. I call it wisdom.."
Without a doubt, I promise you will find dogs in this book who will bring your own old friends to mind. I suspect you'll fall in love with every dog in this book. These beautiful black and white portrait photographs of the dogs will melt your heart. Many of Weingarten's profiles will require tissues. If you don't have a copy of this book, get one. If you're a dog lover like me, you'll find yourself picking it up more often than you can imagine. It is a meditation on the meaning of life with dogs and on love. "Gene Weingarten, a funny man who loved dogs." and to be carved in the shape of a fire hydrant. 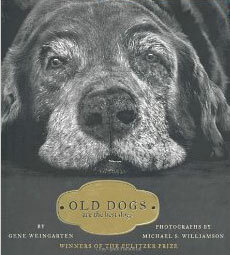 Old Dogs: Are the Best Dogs, published 2008 by Simon & Schuster, 160 pages. Available at major book sellers. Gene Weingarten is a nationally syndicated humor columnist and a Pulitzer Prize-winning staff writer for The Washington Post. He has written two books: The Hypochondriac's Guide to Life And Death and I'm with Stupid (with Gina Barreca). Michael S. Williamson is a two-time Pulitzer Prize winner and works as both a photographer and photo editor at The Washington Post. I love Gene Weingarten's columns... I will have to check this one out!